DRIVING SHOULD BE THE SAME, NO MATTER WHERE YOU ARE. We advocate that MUTCD should be enacted into Provincial Law as a requirement for all cities and municipalities to have a standard approach to traffic markings and signage. The Manual on Uniform Traffic Control Devices (MUTCD) is a document of NATIONAL STANDARDS issued by the Federal Highway Administration (FHWA) of the United States Department of Transportation (USDOT) to specify the standards by which traffic signs, road surface markings, and signals are designed, installed, and used. These specifications include the shapes, colours, and fonts used in road markings and signs and the specifications to apply signage. In the United States, all traffic control devices must legally conform to these standards. The manual is used by state and local agencies as well as private construction firms to ensure that the traffic control devices they use conform to the national standard. The National Committee on Uniform Traffic Control Devices (NCUTCD) advises the FHWA on additions, revisions, and changes to the MUTCD. 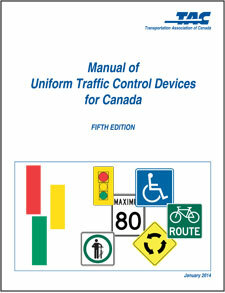 The Transportation Association of Canada (TAC) publishes its own Manual of Uniform Traffic Control Devices for Canada for use by Canadian jurisdictions. While it is not compulsory for use, most jurisdictions adhere to the consistent application of traffic signage, road surface markings and signals design, installation and application in accordance with MUTCD. Consistent signage use is known to enhance safety and driver compliance with regulation. Although it serves a similar role to the FHWA MUTCD, it has been independently developed and has a number of key differences with its US counterpart, most notably the inclusion of bilingual (English/French) signage for jurisdictions such as New Brunswick and Ontario with significant anglophone and francophone population, and a heavier reliance on symbols rather than text legends. There are jurisdictions that require compliance with MUTCD by law. The first MUTCD was released in 1935. Does the City of Winnipeg conform to Canada's MUTCD's National Standards? WiseUpWinnipeg advocates for the application known and established engineering and signage standards. We advocate that MUTCD should be enacted into Provincial law as a requirement for all cities and municipalities in Manitoba. Consistency and sound traffic management practices contribute to SAFETY and efficient traffic flows.